Performers include: Arnold Stang, Maurice Gosfield, Marvin Kaplan, Leo De Lyon, John Stephenson, and Allen Jenkins. Inspired by characters from The Phil Silvers Show, this animated series follows the adventures of con-artist Top Cat (Arnold Stang) –TC to his close friends — and his gang of Manhattan alley cats. The gang members are right-hand “man” Choo Choo (Marvin Kaplan), romantic Fancy-Fancy (John Stephenson), jazz-loving Spook (Leo De Lyon), dim-witted Brain (Leo De Lyon), and innocent Benny the Ball (Maurice Gosfield). Top Cat and his gang are frequently involved in small-time scams, much to the frustration of local Police Officer “Charlie” Dibble (Allen Jenkins). The gang members are complimenting Top Cat on his skill in winning the big race. It turns out that the race was actually a turtle race. As they prepare to hold the next one, they see Officer Dibble coming. They quickly put the turtles on their heads to look like Flintstones-style helmets so that Dibble won’t know they’ve been gambling. He figures it out anyway. The Police Sergeant pulls ups and tells Dibble that there’s a big exhibit at the art gallery and assigns him to guard duty because of the thousands of expected tourists. After Dibble leaves, TC tells the gang that they’re going to make money selling parking spots. Later, Dibble is talking to an old woman when the Sergeant stops by again and tells him that a master of disguise and thief, Al the Actor, is in town. The old woman leaves and goes to an apartment. A thug is waiting there and it turns out that she’s really Al the Actor in disguise. Al tells his friend that he’ll use another disguise to keep the police guessing. We see Benny and Brian checking cars at one side of an alley. At the other end, TC and the gang are renting them to other people. Business declines because people are parking on the street, illegally. TC goes to tell Dibble but he’s intent on watching for Al. He jumps on an old man who looks suspicious but it turns out he’s actually Professor Zimbach, the gallery owner. When Dibble’s not looking, the big white lion statue tip-toes away and is later revealed to be the criminal. Al returns to his lair and decides to masquerade as Dibble. In the art gallery, TC overhears the Professor praising a painting of scribbles. Top Cat gets really interested when he finds out it’s worth $10,000. He leaves and tells the gang that they’re giving up the parking scheme. They take the turtles and let them walk all over a bed sheet with paint on their feet. They frame it and bring it to the art gallery. The Professor is interested but astounded that it costs $20,000. A rich lady stops by and says that she’ll buy it after the exhibition. Later, the thugs lure Dibble into a closet, knock him out, and Al puts on his clothes. The fake Dibble snatches several paintings (including Top Cat’s) and drives off with his accomplice. The other cats see Dibble leave and they’re all astounded. The Sergeant comes by and they tell him what happened. He outraged that one of his cops has gone bad. After the Sergeant speeds off, we see the two crooks on a nearby rooftop. They’re going to relax in the sun and sneak away quietly at night. In the gallery, Dibble comes to in his long underwear and overhears what’s happened. The Sergeant vows to shoot first and ask questions later. Dibble tries to sneak away and ends up stuck in a barrel, rolling uncontrollably around the city. He crashes in Top Cat’s alley. Dibble’s eventually able to convince TC about what’s happened once Dibble says he’ll help get TC’s painting back. On the rooftop, Al tries to remove his disguise but the make-up has hardened in the sun. He sends his accomplice back to the hide-out. Al takes off the uniform and tries to sneak down the alley in his long underwear. The two Dibbles come face to face and TC and the gang can’t decide which is which. Eventually, they catch Al and remove his makeup. TC is happy that he’ll get his $20,000 painting back until Al reveals that he also masqueraded as the rich lady. Dibble calls for the paddy wagon for Al and an ambulance for the fainted TC. First aired: April 18, 1962. 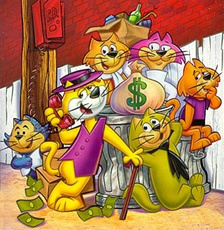 Top Cat and the gang returned in minor roles in later Hanna-Barbera series like Yogi’s Treasure Hunt and Yogi’s Gang. They’ve also appeared in various comic book adventures. In 1987, the characters returned in a made-for-TV movie called Top Cat and the Beverly Hills Cats. It revolves around Benny being left a fortune by a wealthy woman and a greedy butler and his pooch who want to get rid of him. In the end, the lady isn’t really dead, a missing heiress is found, and the bad guys are revealed. In 1991, a teenage version of Top Cat appeared in the Yo Yogi! series about younger versions of well-known Hanna-Barbera characters.